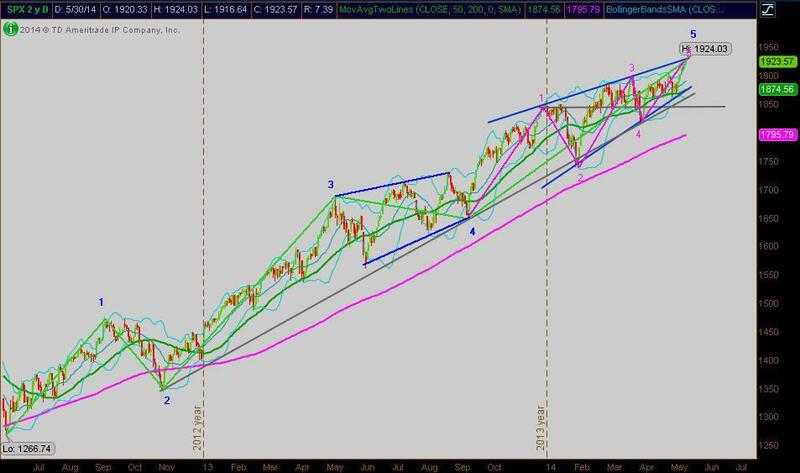 SPX right on track for my revised count from Earlier this year when I was viewing this as an expanding triangle but now it has definitely morphed into a contracting triangle and so far fulfilling all the requirements of a Wave 5 terminal impulse. After patiently waiting we have progressed with final Wave 5 of the terminal almost right to the upper trendline. I am a little disturbed because I see multiple Fibonacci projections to 1980-1990 area. This points to a possible 'throw over" up to this area for the top but it can not exceed it or the whole count is blown out of the water! If a weekly reversal pattern prints right in here I would risk some short exposure however much safer to wait for a break of coinciding lower trendlines of the terminal(blue) and impulse's 2-4 (gray) in conjunction with the COMP's head and shoulders neckline giving way, I am leaving for my summer cottage in northwestern Ontario this week and the priority there is enjoying paradise with family and friends. So I do not analyze and trade, however if we get a stretch of bad weather or I see something extremely significant happen I will post up (I do have internet access there now) but sure Mr Adler will be on top of it before I! Have a marvelous summer everyone.